Our Off-Site Shredding service starts with a scheduled collection of material from your premises. 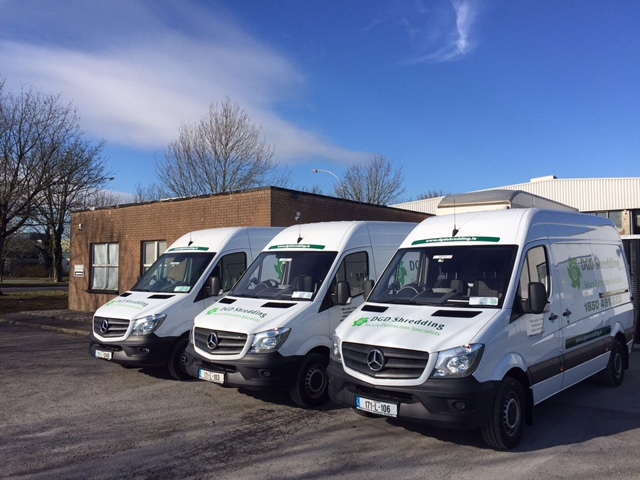 Our fleet of vehicles can cater for both large and small quantities. A uniformed and security vetted driver will arrive at your premises in a sign written vehicle. Once the material for collection has been identified, the driver will remove it and transport it to the vehicle, this may take multiple trips in and out. All our vehicles are fitted with slam locks, immobilisers, GPS Tracking and the load compartment is separated from the driver cabin. Slam locks require a specific key to be used to gain access to the load compartment; this key is a different key to the vehicle key. No vehicles are left open and unattended. Once all the material has been placed in the vehicle a collection docket is issued to the customer. This docket details the specifics of the collection. It is signed by both the driver and an authorised customer representative. The material is then transported back to our secure destruction facility in Raheen Business Park in Limerick. All material collected is shred on the same day. Upon arrival at the facility the Production Manager verifies the material and its accompanying paperwork as it is unloaded. The material is then brought to the shredded and processed. Once shredded a destruction certificated is generated and sent out with an invoice to the customer. All paper material shred is baled and exported directly for recycling.